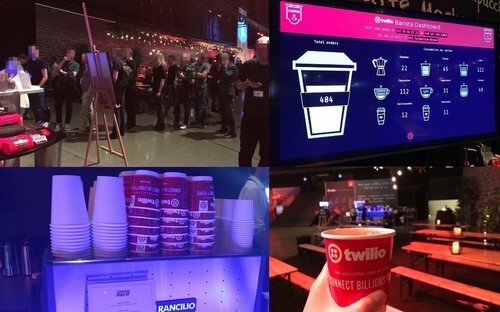 On the birthday of the HTCPCP we figured it’s time to teach you how to build your own serverless version of Barista using Twilio Functions, Sync, and Programmable SMS. Before we get started, make sure that you have a Twilio account (you can sign up for free) and that you have Node.js and npm (version 5.2 or higher) or a similar package manager installed. We’ll offer people the option to order their coffees via SMS. To accept incoming SMS we’ll first need to set up a phone number. We’ll be using Twilio Studio and Twilio Functions for this. Follow this tutorial on building a Barista bot to get the foundation set. You might also want to connect a “Send Message” widget with a confirmation message to the “Success” part of your Twilio Function widget as well. We’ll be storing all the orders in a Twilio Sync List. Start by creating a Twilio Sync Service in your Twilio Console and take note of the Service SID. Afterwards go to the Configuration section of Twilio Functions and add a variable called SYNC_SERVICE_SID with your Sync Service SID. While you are at it, you also want to check the box to activate ACCOUNT_SID and AUTH_TOKEN in your Functions if you haven’t already. // Create a Twilio function and configure trigger it in Twilio Studio. This code will take the passed phoneNumber and order and store it in a SyncListItem together with a status property that we set to 'open' for now. Make sure you save your changes and wait until the Twilio Function has been successfully deployed. 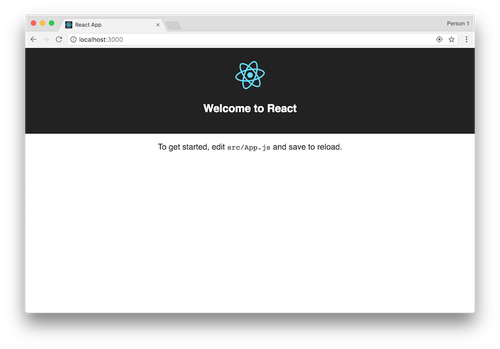 If you are using an older version of npm or another package manager you want to install create-react-app globally and then run create-react-app barista && cd barista instead. The development server will update the browser for every change. So you can simply keep it running for the rest of this post. 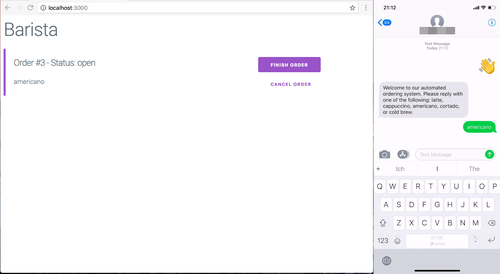 This component will show the order number, the current state, the actual order as well as two buttons to cancel or finish an order. Before we can use Twilio Sync in our React application we need a way to generate a token for the app. 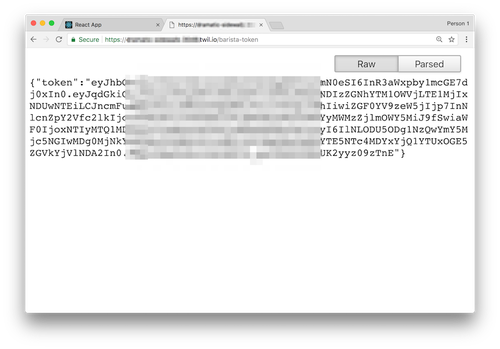 These tokens have to be generated in the back-end and authenticate a user to access the objects of a Twilio Sync Service. You can learn more about tokens in the docs. Give the function a name and a path like /barista-token and copy it somewhere for later. Save the changes and wait for it to be deployed. Before we can test our new endpoint we need to add an API Key & Secret to our Twilio Function configuration. 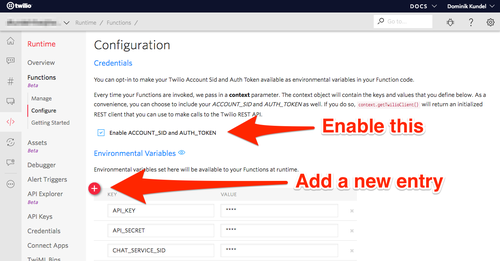 Create a new API Key & Secret in the Twilio Console and store them afterwards as API_KEY and API_SECRET inside the Configure section of your Twilio Functions. Make sure you replace the tokenUrl value with the URL to your respective Twilio Function. Switch back into your browser and it’s time to test our system for the first time. Grab your phone or ask a friend to text in a coffee order to your Barista bot. Once they received a confirmation, refresh the page in your browser and you should see the order on your screen! So far we can fetch orders when the page loads but we could do that with an database. Let’s add a real-time aspect to it by listening on changes of our order list and displaying orders as they come in. SyncLists have a variety of events we can listen for. We’ll start listening on the events itemAdded, itemUpdated, and itemRemoved and update our in-memory copy of the list accordingly. Wait for your browser to refresh (or manually refresh the page) and create a new order. This time the order should appear almost “magically” on your screen without you having to refresh. Switch back into your browser and start clicking the buttons in your browser and you should see the status change. But how do we notify the customer to pick up their order? Twilio Sync has the option to add a webhook that should be triggered whenever something in the Sync Service changes. We can use this to listen for status changes in our order items and then send out an SMS and remove the item afterwards from our list. For this we’ll again use a Twilio Function. Save it, wait for it to deploy, and make sure you go into the Configure section to add the phone number or Messaging Service SID that you want to use to send the SMS into your variables as PHONE_NUMBER. 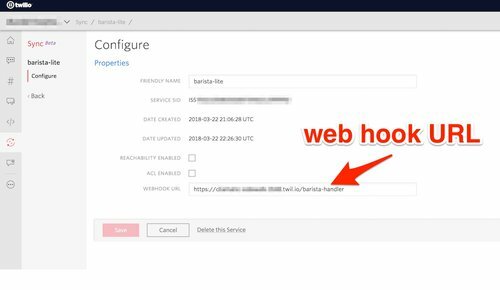 Afterwards go to your Twilio Sync Service and add a webhook URL by adding the URL to your Twilio Function here. 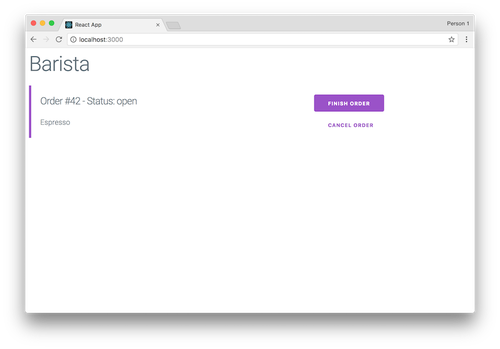 Now go back into your React app and change the status of one of your orders. This should trigger the Function, send out an SMS, and the order should disappear. We finished our basic version of a Barista app and you can find the entire source code on GitHub. If you want to learn how you can take this system one step further by making your Barista bot smarter, check out this blog post about adding Autopilot to this Barista App. 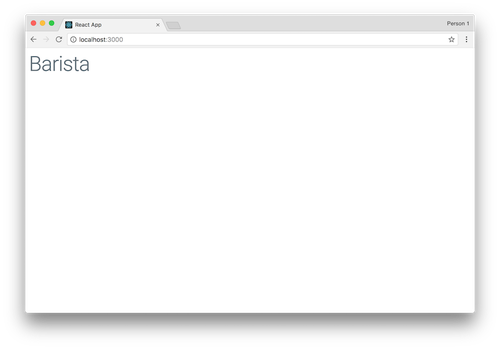 If you want to check out what this version looks like, you can check out the code on GitHub including documentation on how to set it up.